We’re all painfully aware that it’s hard not to grab a second cookie, candy bar or other indulgent snack. Combat the urges by cutting yourself off at the source. The Kitchen Safe is an ingenious way to do just that. Inventors David Krippendorf and Ryan Tseng created a kitchen-friendly container with a lid that only unlocks when you want it to. 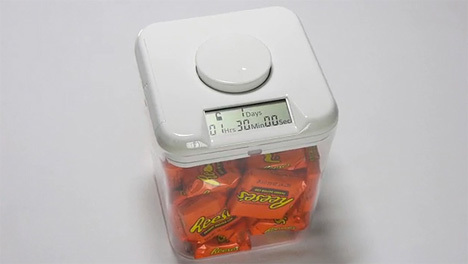 The lid has a built-in timer that controls the lock so that the contents are impossible to reach until the timer reaches zero, in turn keeping your hands out of the proverbial cookie jar. 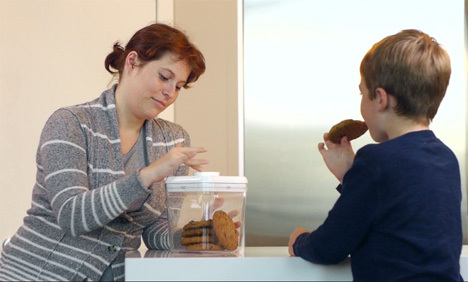 And the Kitchen Safe isn’t limited to sugary treats; it’s also a great way to keep your (or your kids’) hands off of electronics except for at designated times. As with seemingly every brilliant or interest-peaking invention, the Kitchen Safe was initiated by a Kickstarter campaign. For a $29 donation, you can get your hands on this completely awesome kitchen device.